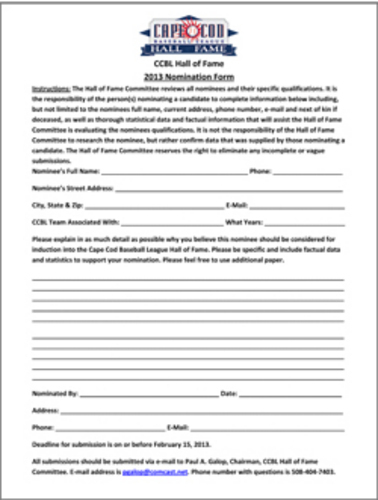 The Cape Cod Baseball League Hall of Fame Committee is now accepting nominations for the Hall of Fame Class of 2013. Those players and coaches that are eligible for consideration would have last participated during the 2008 CCBL season or prior. Deadline for submission of the Nomination Form (attached) is February 15, 2013. Previously nominated candidates who have not been inducted need not be renominated at this time. Any questions or nominations should be sent to Paul A. Galop, Chairman at pgalop@comcast.net or by calling 508-404-7403.